Geology classes might seem like a safe bet for students trying to avoid math. After all, how often are numbers and formulas needed when studying rocks and land formations? Actually, pretty often, according to McHenry County College earth science instructor Kate Kramer, who implemented a program three years ago to help students master the math used in earth science courses. “The Math You Need, When You Need It” is a program that features online math tutorials students complete before working on a lab assignment. Created by Kramer’s former colleague, Jen Wenner, at the University of Wisconsin-Oshkosh and Eric Baer, from Highline Community College, in Des Moines, Washington, the program has been in use by Kramer for the past three years at MCC. She also used it for one year at the University of Wisconsin-Oshkosh, where she taught prior to teaching at MCC. According to Kramer, MCC students’ scores have improved by 21 percentage points after completing the math modules, from 56 percent on a pre-test to 77 percent on the post-test. “It works for every level of student, from pre-calculus to someone who has not had math practice for 15 years,” Kramer said. “I used to spend a half-hour every day calculating slope or density. With The Math You Need modules, students are much more prepared for the labs, which saves us so much time in the classroom,” Kramer said. To make other earth science teachers and geoscientists aware of her students’ success, Kramer presented a program at the American Geological Union Conference in San Francisco last December. This summer, she will teach professors from two- and four-year colleges about the program at the The Math You Need annual conference in Seattle, Washington. In addition to physical geology, Kramer also teaches geology and oceanography and Geology of National Parks, which was added in Fall 2011 and will be offered again in Spring 2013. Kramer found her passion for earth science at a young age and followed the footsteps of her father and grandfather, who are both geologists. Her favorite national park is Arches National Park in Utah because of its unique rock formations that have been carved out by wind and water over millions of years. “It’s beautiful and breathtaking,” she said. Kramer earned her bachelor’s degree in hydrogeology from UW-Oshkosh and her master’s degree in geology from Indiana University Purdue University in Indianapolis. 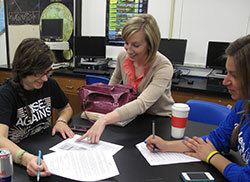 Kramer hopes her passion in geology inspires her students to understand the importance of earth science in their lives. “I want to open students’ eyes to the fact that everything we do and the products we use every day come back to the earth sciences,” Kramer said, noting that common household products come from minerals mined from the earth.